Whether you’re considering early retirement, saving for a trip around the world, wondering how to quit your job, or simply want a way to build financial security, it is possible. 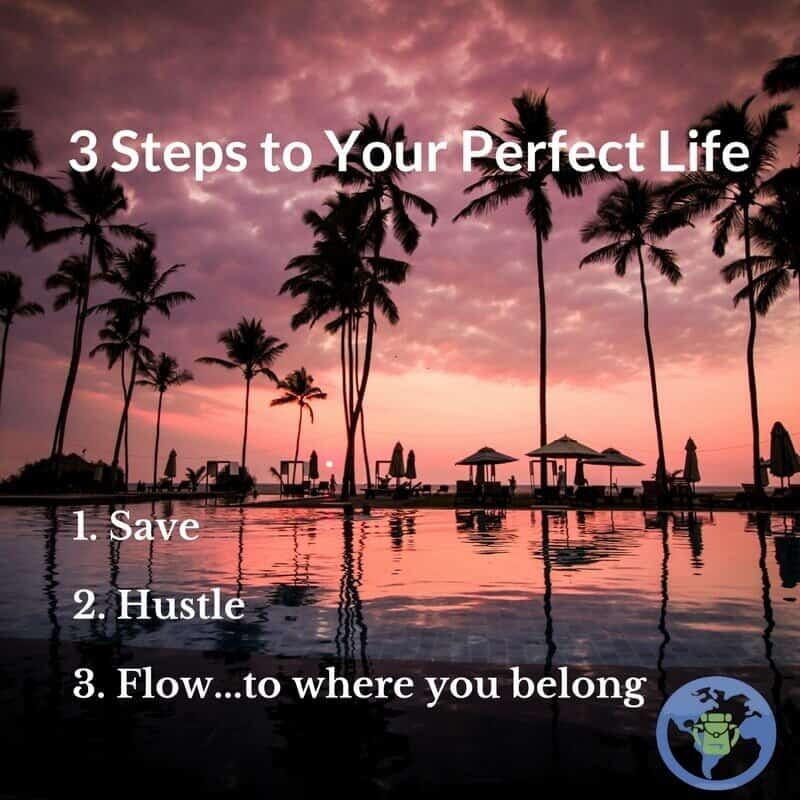 By rethinking how you consume (Save), rethinking your income sources (Hustle), and rethinking how the place you live helps satisfy your inherent needs (Flow) you can design the life of your dreams. Everyone dreams of a life free of the rat race, where they call the shots, consistently doing something they love, and living in a place that surrounds them with the things they need to be satisfied. As mythical as this all sounds, lifestyle design and the financial mobility it requires are well within reach of the average person. You just have to learn how to save, how to hustle, and how to optimize the flow in your life. Eliminate the expenses that aren’t essential to satisfaction. Focus on small, incremental improvements to create big changes in how you consume. The first part of the “save” equation is keeping more of what you earn. How do you keep more? You minimize unnecessary purchases, or “waste”, in all aspects of your life. This doesn’t mean living with the austerity of a monk or a Spartan – I actually live on vacation, seeing bucket-list worthy sites, living in comfort, eating exotic food, and lying on beaches for frequent “therapy sessions”. Optimizing consumption (also known as minimizing) isn’t about eliminating everything. It simply requires examining your life to define what is truly necessary for your happiness and focusing all of your energy (and finances) on those things. In the process of understanding your true needs, you identify and eliminate consumption that is not necessary for your true satisfaction in life. Your needs, and your family’s needs, will be unique but very rarely does the list of things you need to be satisfied match your list of recent (or planned) purchases. Invest your money for long term performance aiming for low fees and reliable, consistent returns on your investment. First, pay off debt as quickly as possible. Second, invest in something that follows the philosophy of small, reliable, incremental gains over the long term while still reducing waste wherever possible. Some great examples are the broad index funds available, such as VTI from Vanguard. Why? This type of investment consistently returns ~7% annually and allows you to keep your money by avoiding the high fees of mutual funds or privately managed wealth funds. The broad holdings of index funds give you the diversification that pros recommend which creates a less volatile investment (than individual stocks) in the long term. Also keep in mind that in the long term that neither mutual funds nor private wealth managers will rarely beat the market meaning that the extra fees aren’t buying you anything — just delaying your retirement. For more great info on investing (and minimalism) checkout Mr. Money Mustache. Use the 4% rule to calculate potential income from your investments. Now, you’re saving and you’re investing, what does this mean for your financial independence? It means that you can take 4% every year of the amount you have saved up (just divide your total savings by 25) forever without having your savings decrease (and it will actually grow by ~3% nearly ensuring that your savings will grow with inflation. A “hustle” is simply a non-traditional way of making money based on a product or service you provide. For people who live independently this translates to an income stream that fits their lifestyle better than being a corporate drone. Most hustles are accomplished by first figuring out what a person excels at that is of value to others, then spreading the word that they provided a related product or service, and finally making it easy for customers to learn about and pay for the newly provided product or service. Hustling’s finest point is that it revolves around doing what you do well. Whereas most people’s jobs are based on the opportunities life threw their way (whether or not they were talented or passionate about the opportunity), hustling is inherently based on you doing things you are good at, things as natural as breathing. And just like breathing, when something is natural it usually feels good. So how does this apply to financial freedom? Few people will amass the amount of wealth required for financial freedom in the period they want to by simply saving their current income and investing. You will save a significant amount (with your new view on reducing excess consumption), but you can improve your quality of life in retirement (or during your mini-retirement) by augmenting your income from savings and investments with a side income stream. So, how exactly do you start hustling? Identify what you’re good at that is of interest/value to others. We all have hobbies and things we do for pleasure, and these hobbies are usually things that we are good. Although not every hobby will be of value to others, you definitely have one free time activity that is. Maybe its brewing beer. Maybe its arts and crafts creation. Maybe its tinkering on your car. Maybe its landscaping. No matter what it is, you have some free time activity that 1) you enjoy, and 2) others will pay for. What if you’re not sure if people will pay for it? Search the activity in Google. If any sites popup providing coaching and tutorials, offering the service, or selling the bits and pieces you need to do the activity then there is an opportunity to turn your free time activity into a hustle. The newly found confidence will give you a great assist in the next step of hustling: tell people about what you do (and how much you love it). The person you’re talking to might not need a unicorn made of chocolate and bedazzled with gummy bears, but they may have an eccentric billionaire friend that has been looking for that exact thing. Or, perhaps this person would be more interested in a white chocolate Care Bear bedazzled with Skittles? In either case you are on the path to getting customers and refining your product based on what people will pay the most for. Note that sharing what you do does not have to be a sales pitch, and it would be awkward if you pitch every acquaintance you meet. On the other hand, sharing your hobbies and passions is a great way to connect with people. Now if the hobby or passion interests someone enough, you can always offer to help…for a fee. Bottom line, tell people about what you can do. Now that you have a great product or service that you are skilled at providing, that you know people want, and that you’re are telling people about, what’s next? Create a business around it. In other words, make it easy for customers to learn about the product or service and to pay your for it. Make it easy for the customer to find your product or book your service. This can be accomplished by creating a digital store, in Facebook, on your own website, Shopify, or through Amazon, for your product. For services, add booking functionality to your customer education page (we love Setmore as a booking tool that integrates into Facebook and webpages). When a location lacks the things you inherently need, you are forced to strive harder for satisfaction. This may mean buying things you don’t need, engaging in activities that leave you partially fulfilled, or flying for hours just to find a place “you belong”. Additionally, if a location doesn’t suit your needs then odds are that you are paying for amenities that you don’t value. Maybe the “waste” in your current location is the “zip code tax”, the luxury of being near specific locations, or even prestige of being in the city. You don’t need everything that the metropolitan “people hubs” offer: few people will visit every restaurant, neighborhood, and show in New York during their time as residents…so if they only experience a fraction of the city is it worth the New York price tag? If what you want is rolling hills, greenery, and the ocean nearby, but you’re not planning on creating a startup, is San Francisco worth the price tag? Would the suburbs of Seattle be a better option? If you can work remotely but love the beach but aren’t concerned with “flashiness”, are LA and Miami really the best options? Or could you do Thailand, the Philippines, or Colombia for a period? You’ll never know unless you check…so dig through best places to live by what you value to make a list of options and narrow down to the true finalists. You only need the things that fulfill you, everything else is excess: Do you need nature? Look into Utah and Montana over Colorado. Do you need museums and art? Consider a non-capital city in Europe for a period. Do you need to be social? Nashville, Tennessee has plenty of bars and live music and a price tag that is a fraction of that in Austin, TX. • Do you really need to live in a particular state? • Do you really need to live in the US? • Is the salary difference for a lower paying city worth the increase in quality of life and decrease in cost of living? Most people only consider the familiar when sifting through options…but this eliminates a world of possibilities, literally. When most people think of a mountain paradise, they immediately think Boulder, Denver, or some other overpriced Colorado hub. I think Patagonia. I spent a summer in the area with few compromises and lived off ~$1500 a month on average and ~$2,000 when I splurged. That included tons of Argentine BBQ, tons of trekking, lots of wine, and comfy accommodations. If I asked you where to go for a beach vacation…would you say San Diego or Miami? I would say the Galapagos islands in the off season. Lobster dinners, yacht tours, and tons of adventure, for cheaper than my life in San Diego. I can describe a similar scenario for art and museums (eastern Europe), mountainous trekking (Andean countries), food (the Mediterranean), arts &culture (too many to list), and everything else you could imagine. Rome wasn’t built in a day…neither was Apple. On top of that, most of us have been steeped in our current ways of working and consuming for years. What’s the point? It will take more than an instant to design a new life. The effects of saving and consuming less will be visible immediately but require conscious and consistent change in habit. Building a successful hustle commonly takes at least a year of concerted effort according to most entrepreneurs, bloggers, and freelancers. Identifying the location that best fits your flow takes deep introspection, questioning how you see your world, and asking question you may have not addressed or considered for a very long time. What does this mean? Put in the time, stay dedicated, and you will get back improved quality of life for as much as you invest in this process of saving, hustling, and optimizing flow in your life. Interested in more detail on how to Save, Hustle, and Flow in your life? Join our free 6 week email course and we’ll keep the lessons and thoughts on lifestyle design coming to your inbox.